Doctors are vital to the U.S. military branches, and despite the volumes of historical research on their contributions to military medicine, less is said about their professional careers as civilians once their service is done. As America embarks on the centennial of its entry into World War I, and in honor of veterans on this national observance of those who have served—and those who continue to serve today—a look at physicians who served in the First World War will illustrate their larger contributions to the civilian medical profession. World War I doctors served in the Medical Corps (career medial officers) or the Medical Reserve Corps (credentialed civilian physicians) during their military service. Many arrived to Army training camps with no experience in field or military medicine, and trained for several months in areas of sanitation, gas defense, and psychology. Doctors in the battlefield faced numerous challenges including low morale, diseases and epidemics, gas attacks, and climate. Drawn from the NLM’s AMA Deceased Physicians Masterfile 1906–1969, these biographical vignettes help tell the story of veteran life after the Great War. Irvin Abell of Louisville, Kentucky, spent most of his postwar career at the University of Louisville as a professor of surgery. During the war, he served as a lieutenant colonel, promoted to colonel, in the Medical Reserve Corps at Base Hospital No. 59. 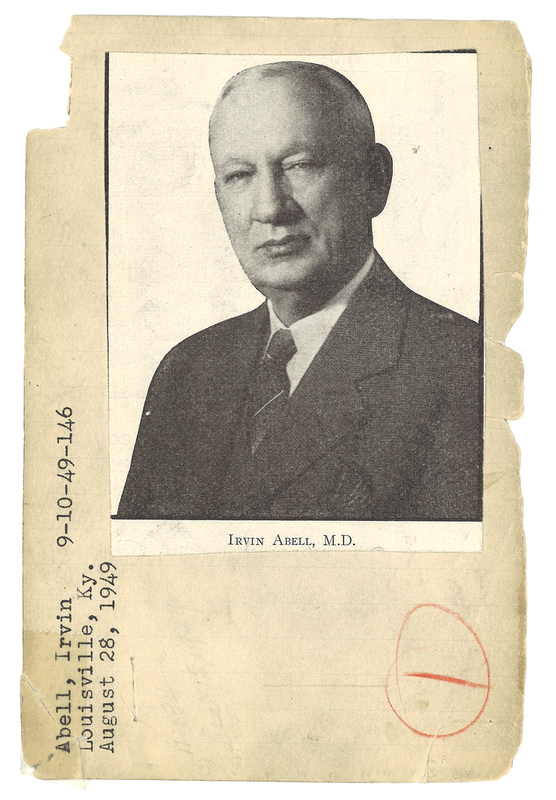 As a member of the American Medical Association, he served on the AMA’s numerous committees as well as president of the organization, serving from 1938 to 1939. Abell specialized in surgery, actively participated in medical associations related to his field, and was awarded honorary fellowships and degrees including the Royal College of Surgeons. Thomas Murdock of Meriden, CT, served in the Army Medical Corps during World War I. Earning his medical degree in 1910, he entered into private practice. After the war, he was an attending physician then chief of medical services at Meriden Hospital until he retired in 1949. Like his colleagues, he served on numerous medical commissions and local societies, including the board of directors for a bank. He died in 1957. For many doctors, information regarding their military medical career can be sparse, which emphasizes the important role that these veterans played in civilian society after their military service. The men served their communities until retirement or death. John Murphy of New York served in World War I. He earned his medical degree at Jesuit University (now Fordham University) and practiced in St. Louis, MO, in obstetrics until his death in 1937 of coronary thrombosis. Robert Zaegel of Sheboygan, WI, served as a medical officer. Prior to leaving for Europe, he worked as an intern at the Denver City and County Hospital. He died in 1960 of metastatic carcinoma of the liver. Historians writing on social, cultural, and health topics related to medical professionals will find available primary sources regarding doctors, dentists, and nurses, and other specialists in the AMA Deceased Physicians collection. This unique resource is a wealth of information documenting the medical profession from the late nineteenth-century to mid twentieth-century. For example, included in the file there is documentation on approximately 1,000 male and female African-American physicians, and approximately 5,300 female, all practicing in a variety of medical fields. From the biographical cards, we can learn about their educational backgrounds; acceptance and failure rates among the medical schools; professional practices and trends in specialties; growth of professional organizations and specialty associations; issuing of licenses and actions revoking the doctors’ licensure; and causes of death and related health issues and military service. To the many who practice medicine in uniform – thank you for your service. The AMA Deceased Physicians Masterfile 1906–1969 may be inspected in person by visiting the National Library of Medicine, History of Medicine Division located on the campus of the National Institutes of Health in Bethesda, MD. Thanks for this. You should mention that female physicians were not permitted to serve in the military at this time. Thanks for this comment and expanding the discussion. Yes, American women physicians advocated for inclusion as medical personnel in World War I. This post draws on the National Library of Medicine’s unique collection of records from the AMA. Another organization, the American Medical Women’s Association (AMWA) was founded in 1915 in part to address this issue through the work of their War Service Committee. Hello Katherine, thanks for your comment. I will pass your request to our reference staff. In the meantime you can review our website on Genealogical Resources available at NLM and learn more about planning research here. Thanks for publishing. Looking forward for more.